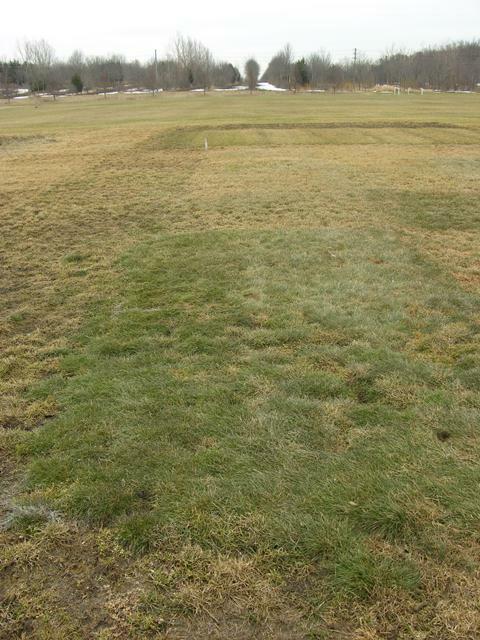 The resumption of turf growth after the winter has been slow. Neither sunlight nor warm temperatures have been anywhere to be found. The repercussions are widespread in the turf world. 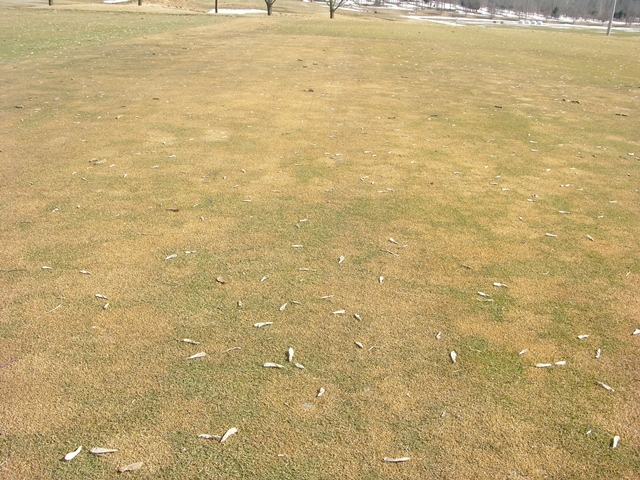 Golf courses that have winter injury have overseeded or sodded the damaged areas but cool, wet weather is delaying seed germination and sod establishment. 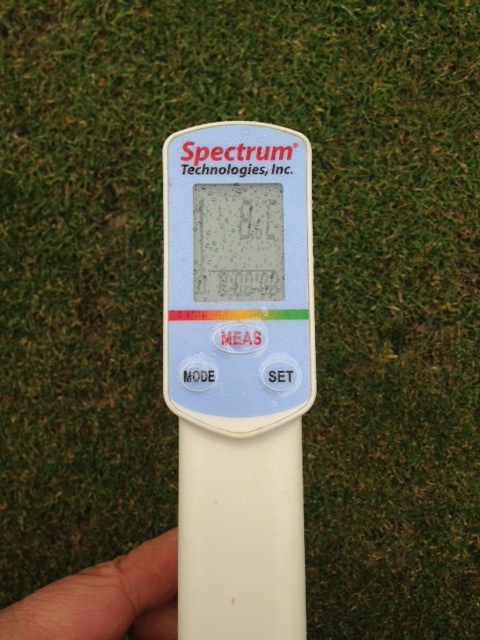 Soil temperatures at the 3 cm depth are only at 8-9 degrees C. The optimum temperature for creeping bentgrass seed germination is closer to 16-18 degrees C. You can see we have a long way to go before we get to those soil temperatures. It will be a real exercise in patience this spring waiting to see new seedlings establish if we don’t see some sunshine and warmer temperatures soon. Sports Turf Canada (the new Canada wide sportsturf association) is having a meeting here at the GTI and they are reporting that many municipalities have had to delay the opening of their sports fields because of wet conditions. There isn’t much relief in the long range forecast as far as warm temperatures and sunshine are concerned. We are supposed to reach a high of 18 degrees C on May 8th but then it is cooler, cloudy and wet after that. Well …….. maybe not fifty, but there are many dead areas of turf and the range of colour of dead or damaged turf is astounding. Also, I don’t think this post is going to be a bestseller. I guess the reason for the range is that there have been many pathways to the death of turf this spring. There is definitely dead Poa annua that died of anoxia (too many days under the ice cover), Poa annua that may have died from direct low temperature injury, or crown hydration and even in some cases perhaps desiccation, not to mention snow mould and there may even be some damaged creeping bentgrass. The colours don’t really mean anything and some of that brown turf may green up. The extent of the damage is still not clear in many areas. Let’s hope the next three days of temperatures in the double digit will help reveal the extent of the damage. On home lawns and sportsfields, there is plenty of snow mould injury but there is also the possibility of winter injury to our most susceptible lawn and sports turf species perennial ryegrass and tall fescue. Many of you are still in the assessment phase and until you have a handle of the extent of the damage it is hard to have a comprehensive plan. 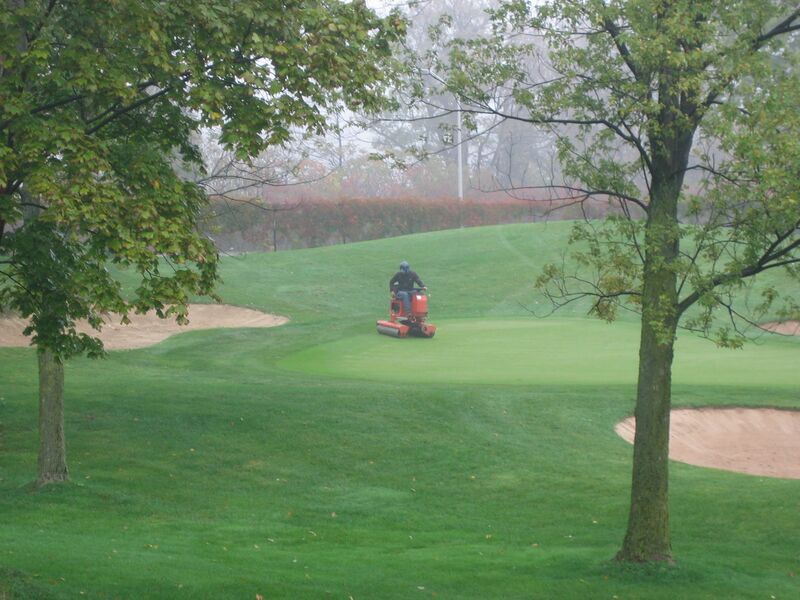 Covers can speed up recovery, especially if we continue to have a colder than normal spring. Companies that have been supplying covers have had them flying out of their warehouses. There have been many questions about the best type of covers or which colour is preferable for warming up soils and promoting turf seed germination. Interestingly enough, there doesn’t seem to be any good information on this. You want to be able to warm up the soil on a sunny day and prevent the heat loss from the soil on cool nights, so not sure what works best for that. At this point, the best type of cover is any one that you can lay your hands on. Prepare damaged areas to maximize seed to soil contact. 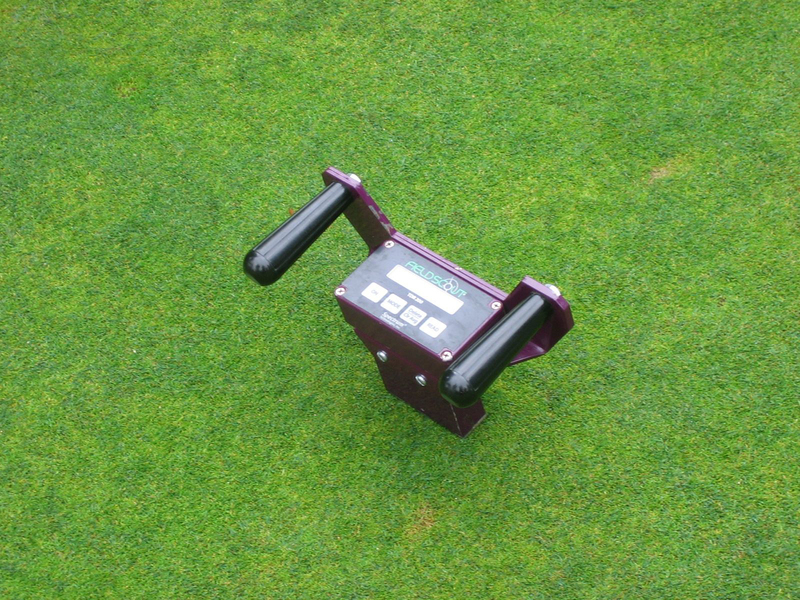 A common method on golf greens to achieve this is to core aerate, topdress, seed and then go over badly damaged areas with a Jobsaver to maximize the seed to soil contact. On home lawns and sportsfields, scalp the turf to create as much seed to soil contact as possible and either slit seed or broadcast the perennial ryegrass seed. As mentioned above, covering the greens or damaged areas of sportsfield will help speed up the germination and recovery efforts. Adding phosphorus has also been demonstrated to help speed establishment. 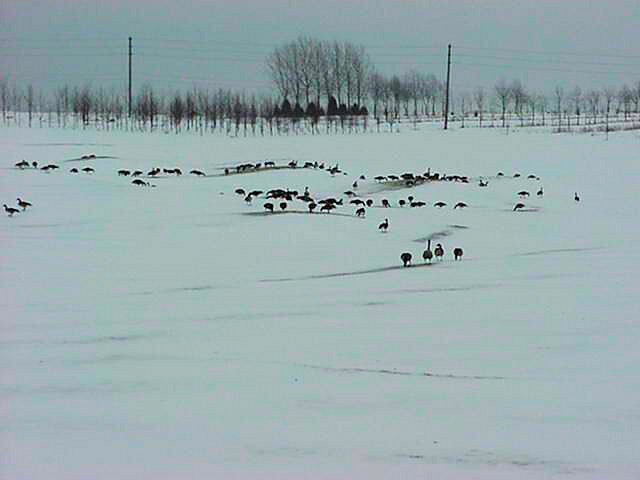 MSU Turf blog has a good summary of actions to take to recover from winter injury at http://www.msuturf.blogspot.ca/. Even with covers, it will require some cooperation from Mother Nature to get speedy turf recovery this spring.